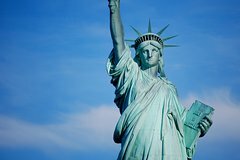 See two of the biggest attractions in NYC in one 3 Hour Tour of the Statue of Liberty and Ellis Island! You will be lead by a professional voice actor and historian with over 100 5 star reviews as a tour guide. This tour has been designed to be both entertaining and informative. Our world class guide and professional story teller will take you to the best places in the New York Harbor. This tour starts with Early Access Reserve Tickets to get to the Statue of Liberty before the big crowds. Once there, you will learn about the history and construction of the Statue of Liberty. You will get amazing pictures with the Statue of Liberty and an awesome view of New York City, One World Trade Center, and the New York Harbor. Then hop back onto the ferry to experience Ellis Island and learn about the incredible history of the island and the intense process of immigration to America that took place on Ellis Island between 1892 and 1954. Meet your guide at 9:30 AM in Battery Park just outside Castle Clinton. Then your expert storyteller and guide will take you on the ferry to Liberty Island. With priority boarding Reserve Line Access, you will get to to bypass the large crowds. Then enjoy a relaxing ride on the ferry to Liberty Island. On the boat you will be able to take some incredible pictures of lower Manhattan, Ellis Island, The One World Trade Center, and more. Once you have arrived at Liberty Island, your guide will give you the scoop on the fascinating history and construction of the Statue of Liberty. They will then take you to the very best places to get pictures with the Statue of Liberty and the New York Harbor. Next take a short ferry ride to Ellis Island where you’ll walk in the footsteps of millions of brave immigrants who came to America in search of new beginnings and a new life. Your guide will walk you through the experience of going to Ellis Island. You will see the awe inspiring Registry Room, the Baggage Room, the Wall of Honor, and the infamous Stairs of Separation. Your tour concludes on Ellis Island at about noon. You are then free to explore the island to do research on family members that may have come through Ellis Island as you please.